Not to seem too self-centred, but I decided to write my last post for the Ecumenical Women at the UN this year (please, do not shed too many tears, you will always find your way back to me I’m sure) about a tribe which I belong to. NO, not the shoes- addict anonymous. Seriously people, focus with me. I’m talking about the women bloggers, those mysterious women who sit behind their computers; writing about politics, fashion, society, literature, violence, religion and the list is endless. From the Iranian Civil Rights activist tweeting live about the Green Revolution in Iran, to the photography-lover immortalising street scenes, women are all over the Web, getting visibility and shaking society. It all started when I first published my own blog, and quickly discovered how my own country, Lebanon, was ridden with female bloggers, gathering momentum around their work, debunking the age-old myth of the Female Incapacity to Manage a Computer (known as the FIMC syndrome). I also pleasantly discovered that the Egyptian young women were the majority of bloggers within the Egyptian youth. Now graphic designers, marketing specialists, humanitarian workers, journalists and women from different backgrounds and interests can create their space online thanks to blogs, in a creative, cost effective and interactive way. Being the tedious women’s rights advocate that I tend to be, I had to research the women’s status in the blogosphere. How many of us were there out there? 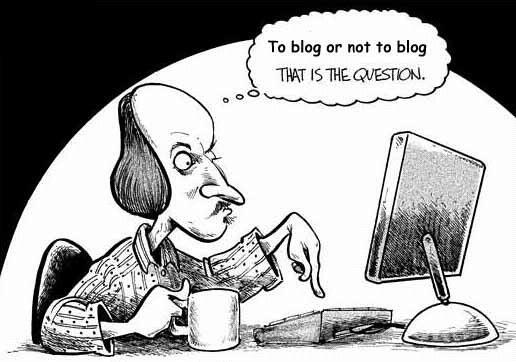 Sadly, I soon discovered that women were NOT the Queens of the Blogosphere, and that, as in just about any other fields, there was still a lot of work to do to encourage women to benefit from the opportunities blogs offer. In October 2009, Technorati, the main search engine for blogs, released its “State of the Blogosphere” report, which showed that 67% of bloggers are men, a number that has increased compared to last year’s results. It is all the more interesting to note that women rule the social networking websites, like Facebook for example, but represent only less than one third of the bloggers. Are we witnessing an online version of the sociological phenomenon of women considered being more “sociable” than men? It seems to me that these results just strengthen the common – and observed- belief that women tend to pay more attention to relationships whereas men focus more on work and “intellectual” things. Another reason that has been expressed to explain the lack of women in the blogging community is that women are “intimidated” by blogs and how to create them (here comes the FIMC syndrome again). I personnally don’t think this is the reason behind the statistics. The other interesting point this study raised was the educational background of bloggers: indeed, bloggers tend to be more educated than the rest of the population, with 75% of them having college degrees and 40% graduate degrees. 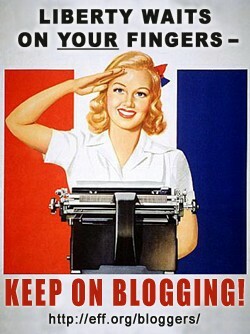 If so, could the lack of women bloggers be a manifestation of gender inequality in terms of access to education? UNICEF nicely informs us that, of an estimated 101 million children not in school, more than half are girls. Enough said don’t you think? So first of all, to be able to blog, women and girls should be granted the right to attend school and study (or in other words, to simply fully enjoy their BASIC HUMAN RIGHTS). And if they do study, and become highly educated, in order to be able to spend time cursing Blogger and WordPress, they would have to have time. And time my friends, is a luxury for women, for who could possibly still be bothered to blog after working all day, taking care of children, housekeeping and remaining sane? Remember, working women still spend about an hour more doing household chores than their male counterparts. And this is how you end up with two third men bloggers vs. one third men: gents, when you’re blogging, your partners are cooking/cleaning/tending to kids/probably cursing you. So I guess blogs, as products of the global society, shows us what we already knew: women are marginalized, kept away from a tool that could help them express themselves and give them a voice, and frankly, it’s getting tiring. So yes, we have to enable women and girls to have access to education and training. You know I’m not stopping there don’t you? Well, I’m not. Educate and train men as well. Train them to change nappies (that’s your child too you know), to cook and to clean (No darling, hiding dust under the carpet is not a known cleaning strategy). But most of all, for the love of God, train them not to expect a medal for doing it. You need also consider that many female bloggers blog about personal matters, and therefor have protected / ill-promoted blogs. I like the analysis, but we need more proof, I don’t think it’s simply because men have more time, or women having less time, I agree with the fact that blogging is a mirror of real sociological life, and thus women tend to get a bit carried away with social things rather than projecting their intellectual what’s on their minds things. I think that women are more than willing to share whatever intellectual, cultural, or personal things they might have on their minds. However, it is a reality than they still do most of the juggling between work and family life, and are therefore more likely to be the ones to give up their leisures and interests to get the household up and going. It is of course a generalisation based on stats, and I do realise that of course (and thank God) not all women are in this situation. The other sister of The Sister Project is similarly delighted to see The Sister Project mentioned here in such fine company. Many thanks. Now I, too, will be off to read the other blogs. This is a great post! I agree that more research needs to be done on the issue of women’s use of technology. However, it does appear that while there are pockets of women using blogs and other social media intensely around the world, like the Technorati report states these tend to be more educated women with the time to devote to using these tools. Almost half the respondents of the Technorati survey were from the US and even at that women bloggers were in the minority. Imagine how much more, women living in places where there are lower school attendance rates and with more conservative cultures that severely restrict women’s time.